Being a champagne expert doesn’t make you a Stephen Fry, as Tom Stevenson and co-judges, Essi Avellan MW and Tony Jordan, would be the first to admit. Announcing the 2015 Champagne and Sparkling Wine Awards at the Vintner’s Hall, Stevenson’s delivery was accompanied by a squeaky voiceover whose digital unmentionables were apparently being squeezed. The lack of slickness was compensated by plenty of bling in the bottle and an enlightening analysis of the world of bubbles. No surprises for guessing that France was the most successful country with 19 more gold medals (46 in all) than second place Italy. France has a head start with Champagne and ‘the advantage of over 150 years of fame and fortune’. The 2004 Louis Roederer Cristal Rosé won Supreme Champion, but champagne was not the only fruit. With entries from Burgundy, Loire, Alsace and Limoux, the judges assessed Limoux as ‘impressive’, while Burgundy emerged as the perennial ‘could do better’ of the fizz wine world. Italy ‘has come of age as a sparkling wine nation’ says Tom, with Franciacorta and Trentodoc, battling for classic brut-style honours. While Franciacorta triumphed last year, this year it was the turn of Trentodoc, whose Ferrari, as Sparkling Wine Producer of the Year, showed that it’s not just the car that has luxury status, while the Rotari NV Brut Rosé won best value for its refreshing summer pudding style. There was praise for Prosecco too which won four gold medals, all from the excellent Nino Franco. ‘Twenty years ago English wine was a joke. Now it is a world class sparkling wine’, said Stevenson. With 13 Golds, England was the third most successful country, with the outstanding Nyetimber 2010 Classic Cuvée the national winner. Australia was ‘a steady hitter’ with 10 gold medals, the best of which was Tasmania’s House of Arras 2005 Grand Vintage Brut. New Zealand should be more famous for fizz, says Stevenson, but it’s mired in corporate red tape and hasn’t yet found a way of turning its sparkling sauvignon blanc into the next Prosecco. South Africa’s Cap Classique is ‘a sparkling wine enigma’ with the crisp, intense 2009 Avondale Armilla Blanc de Blanc Brut the winner. The US was the only country to fare worse this year than last although the winning fizz, the 2007 Caraccioli Cellars 2007 Brut, was exceptional. While critical of Cava, it was ‘rewarding to see the quality of Spanish sparkling continue its upward climb, with more purity and elegance’ especially in the winning Segura Viudas NV Reserva Heredad Pinot Noir . Countries that may surprise you with the emerging quality of their fizz were Canada, Germany and Serbia. Stevenson also touched on the ‘watch-this-space’ potential of Brazil, China, Hungary, Slovenia, Switzerland, Portugal, Russia and India. The full results: www.champagnesparklingwwc.com/results/results-2015. 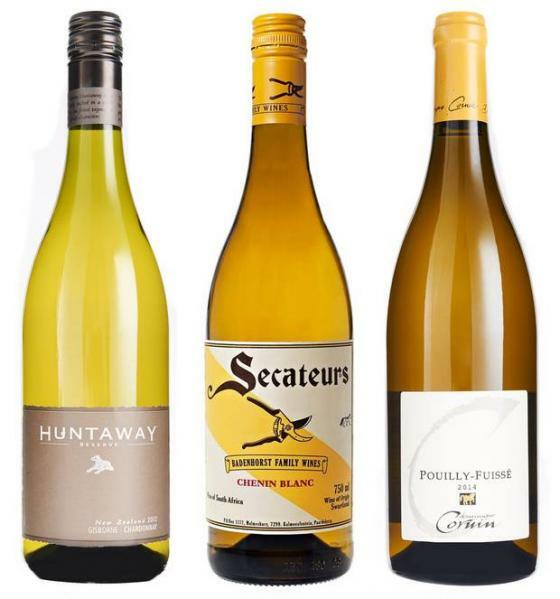 2012 Huntaway Chardonnay Reserve , Gisborne, New Zealand. A stylish number from Gisborne, whose light veneer of nutty oak is supported by a refreshing cool streak of melon and pure, peachy opulence, chiseled by a pineappley-crisp tang. £7.99, down from £10.99, till 13 October, Waitrose. Appetising Cape bush vine chenin blanc with opulent stonefruit flavours streaked with honey and toasty characters and cut by a trenchant citrusy bite on the aftertaste. Around £11.80, Apostle, Handford, Harvey Nichols, Philglas & Swiggot, Oxford Wine, Hedonism. There's finesse, freshness and nuttiness bringing aromatic complexity to this beguiling Mâconnais white burgundy along with an apple and peach richness of fruit with finely delineated texture and fruit purity and a subtle background nuttiness. £17.95, Corney & Barrow.